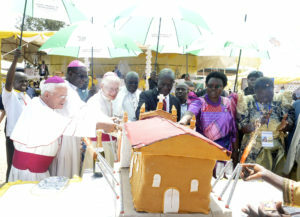 Vice President Edward Kiwanuka Ssekandi (centre) joins Papal Nuncio Archbishop Augustine Blume and other clergy to cut the centenary cake for St Antony Parish Angal in Nebbi District at the weekend. President Museveni has urged the Church to emphasise morals and hard work in its preaching for attitude change towards development. The President’s message was contained in a speech read for him by Vice President Edward Ssekandi during celebrations to mark 100 years of existence of West Nile Catholic Parish of St Antony Angal. In his message, the President lauded the church founded by Comboni Missionaries as important conduit for attitude change towards development. “Sensitize people on the value of hard work, faithfulness, patience and self-reliance. Continue being agents of positive change in society beyond evangelism, teaching and discipleship,” Mr Museveni said. The President Museveni added that Uganda is blessed with abundant resources and good climate but the challenge is the commitment of leadership to develop it. “The current time entails hard work coupled with justice and integrity that must be taught to the next generation. This is the only way to preserve the nation from infiltration by the current global moral decadence,” he said. He also praised the Comboni missionaries for supporting the government as seen in the social-economic changes witnessed in the areas of education and health. The President contributed Shs30 million towards the function and also reminded the people of West Nile to maintain peace and security. The celebrations, presided over by Papal Nuncio Augustine Blume, attracted hundreds of Catholic faithful from Zombo, Arua and Nebbi districts.